I’m a lawyer, so I could write with some authority on my comprehensive article on choosing the best law school backpack. For this post, I turned to a friend of mine, Jasper, to get her advice on picking the top backpack choices for medical students. I’ll let her take it away! You’ve made it to medical school (congrats!) and now you’re gearing up for the long trek ahead of you. The pre-clinical lectures of years one and two. Studying for Step 1. The clinical rotations of years three and four. Then residency! If you’re gonna be ready for the long road (and also maybe a little excuse for retail therapy), your backpack probably needs an upgrade. Lucky for you, in this article, I’ve compiled a list of top recommendations for backpacks for medical school students, based on the experiences of real students just like you. If you’re anxious to stop procrastinating and hit the books, skip ahead and check out our top recommendation, the Timbuk2 Authority Pack, on Amazon right now. If you’d like to avoid those anatomy flashcards a little longer, read on ahead! If you’re in medical school, you already have a lot on your plate. It’s a tall order for a backpack’s job description. But the Timbuk2 Authority Pack has quite an impressive resumé. Available in 9 elegant colors, this backpack has a main compartment that’s perfect for your laptop (up to 17 inches), books, and a change of clothes. A smaller front compartment is equipped with plenty of little pockets for pens, planners, or other miscellaneous items. Stash your stethoscope safely in here and you’ll never be unprepared! The outside features an easy, access stretchable Neoprene side pocket to keep your water bottle or umbrella. Stay hydrated on the inside, dry on the outside! The base of the backpack has dual purpose compression straps. You can use these to secure a yoga mat (regular exercise is good for your brain!) or an extra jacket. If you don’t have anything to put here (it’s okay, I’m a bit of a couch potato, too), you can tighten them to compress the bag. This ensures your bag can fit into your locker at school or your cubby at the hospital. Tucked away, safe and sound. Like I said, quiet and unassuming. Don’t forget the nifty little key fob! Never lose track of your keys again. 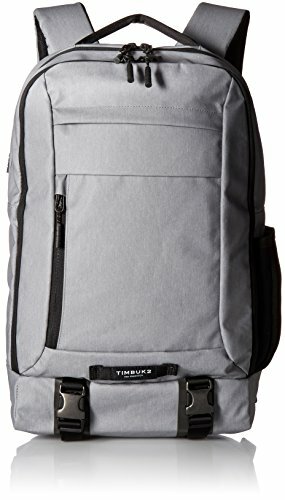 If you’re still unconvinced, consider Timbuk2’s lifetime warranty on this backpack. You’ll have (more than) 99 problems in medical school, but a subpar backpack certainly won’t be one of them. You can check out the many different colors and other reviews of the Authority Pack over on Amazon now! It’s okay to admit it. If you’re a medical student, you’re probably at least a little Type A, at least a little obsessed with organization. The Container Store might be your favorite place. I’m not judging! But the High Sierra Endeavor Backpack might be the choice for you. 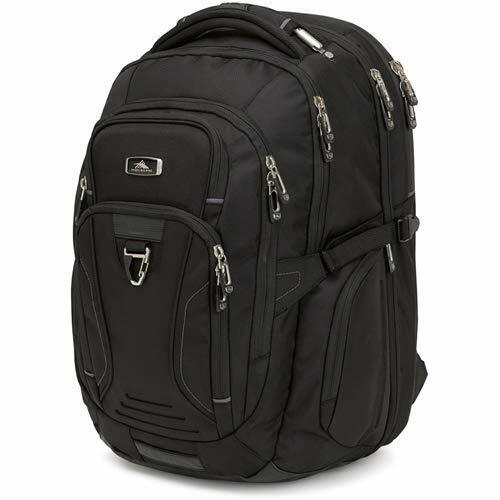 As expected, this backpack has a padded tech compartment that can fit laptops up to 17 inches. This compartment is lined with fleece, and is specially TSA approved so that you won’t have to take out your electronics when passing through security at the airport. Very handy when you’re traveling for away-rotations or residency interviews. Or going home to visit family. Just anterior to this (anatomical terms to keep you on your toes! ), there’s a main compartment that opens up all the way, suitcase-style, and is chock-full of mesh zippered pockets. Keep your books and scrubs here. And your charger, earphones, stethoscope, pens, and whatever else your heart desires. Each in its own designated pocket! I think I’m in love. If that’s not enough, there are two more compartments on the front, and the lower one opens to reveal even more organized zippered pockets and a key fob. There are also mesh pockets on each side for quick, easy access to things like your water bottle, umbrella, or ID card. Check out more info about this great bag and buy one for yourself over on Amazon now. And by budget, yes, I mean student budget. Because four years of medical school tuition is expensive enough and you won’t exactly be rolling in dough afterwards during your residency years. No worries, we’ve got you covered. Look no further than Mancro’s Laptop Backpack. Don’t get me wrong, this is a stylish, high-quality backpack, and comes in 4 lovely colors. The 17” laptop compartment features a combination lock so you can always rest easy that your valuables are secure. With 3 main pockets, 9 smaller inner pockets, and 2 zippered side pockets on the outside, you’ll have plenty of room to also pack a change of clothes, your books, notes, snacks, and any smaller miscellaneous belongings. 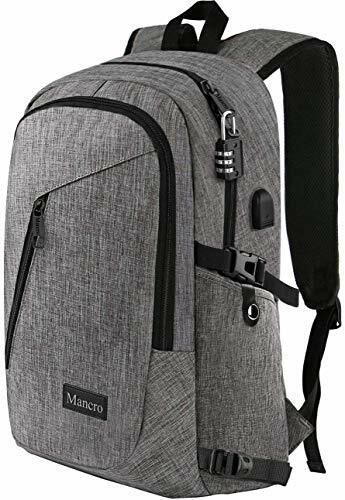 Additionally, the Mancro Backpack also has an external USB with a built-in charging cable so that you can charge your phone or tablet on-the-go. It’s a budget buy, but it’s definitely not budget quality, with water-repellant, durable nylon fabric, sturdy metal zippers, and comfortably padded shoulder straps. You can grab one for yourself and get the best price over on Amazon by clicking here. If you’re hoping to do some shopping on your own, I have a few suggestions for you! Between juggling lectures, labs, volunteering, interest groups, preceptorships, research, and hopefully some kind of social life to keep you sane…the last thing you want is to have to dig through your backpack to find your keys at the end of a long day. Or to not be able to fit in your scrubs and your physiology textbook as you’re rushing out the door in the morning. In some ways, the best backpack for you is the one you don’t notice. It does its job quietly, unassumingly, and perfectly. It holds your stuff, all your stuff, in an easily accessible place, so you can access it when you need it. It’s capable, durable, practical, and stylish, but not too gaudy. Perhaps the most notable thing about medical school is the sheer number of costume changes involved. You’ll want a dedicated pair of scrubs for anatomy lab — the smell of that place sticks to you! Some days you’ll need your white coat and the necessary accompanying professional attire. During clinical rounds or shadowing, you’ll find certain hospitals require a specific shade of scrubs to wear into the OR. Not to mention you might need to carry around your stethoscope, reflex hammer, and pen light. Gone are the good old days of undergrad, of rolling out of bed and going straight to lecture. This means that in medical school, you’ll need a backpack that can fit these changes of clothes! If you’d like to make sure you keep your anatomy lab scrubs and shoes separate from your books, or your white coat folded neatly in a pocket of its own, be sure to choose a backpack accordingly! At the very least, make sure your bag of choice is spacious and durable enough to hold more than just notebooks. Actually, speaking of notebooks, there’s a good chance you’ll be toting your laptop to lecture with you. Most medical schools exams are administered via computers, so you’ll likely have several computer-based assignments to help you get adjusted. And it’s simply easier these days to type notes during all those information-dense lectures. It’s a good idea to buy a backpack with a padded compartment that will keep your laptop or tablet computer safe and secure. If you’re just starting your first year of medical school, your backpack needs have probably changed dramatically since undergrad (or high school…props if you made it last that long). But with my list of recommendations, picking a new one out doesn’t have to be a headache. Like I said above, my favorite is the Authority Pack from Timbuk2. It can be as easy as simply going with our top recommendation! If that doesn’t suit your fancy, no sweat. Just be sure to look at your average schedule, anticipate any outfit changes throughout the day, and lean towards backpacks with dedicated laptop space. And maybe even leave a little room to carry snacks for those long days of lectures! What are you waiting for? Go ahead. Pick out a backpack and get back to studying!